A real estate auction has both pros and cons for buyers and sellers. Courtesy photo. According to Kraupie's Real Estate & Auctioneers, purchasing property can save buyers time and money as this method often translates to a motivated seller who is following an established timeline. Real estate auction also puts buyers on a level playing field because bidding is an open and transparent format and all bidders are working from the same terms and conditions. 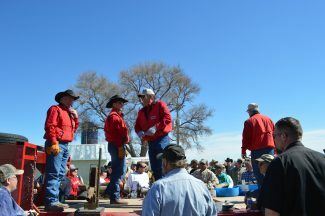 "Do your homework before the auction so you know what the property is worth to you and you can bid with confidence," said Darrell Kraupie, Kraupie's Real Estate and Auctioneers, Bridgeport Nebraska. "It is always in the buyer's best interest to be in touch directly with the selling agent to discuss bidding options and understand the latest information related to the property," Kraupie said. When a property has been advertised and all interested parties have been given an equal opportunity to buy, selling real estate at auction can assure that a property will bringing what it's worth. "Auctions differ from other methods of sale in that they work in most markets. No property or is too big or too small to sell at auction. We've sold properties for hundreds of thousands of dollars more at auction than sellers and/or brokers would have ever considered offering them for at private sale," Kraupie said. It's important to hire a reputable professional real estate auctioneer. A reputable auctioneer is one who has been in business for an extended period of time and continuously provides successful results. The right professional will have a firm grasp of their client's goals for the property and be able to advise them on the current market, guiding them through the process to a successful outcome. They will fully understand the property, its characteristics, and the local factors that could affect the sale. They will also have knowledge of potential buyers, locally and nationally, for the type of land in the area. "Experienced auctioneers will recognize and understand the difficulties a property may face and have the required knowledge to resolve them, making a big difference in the seller's experience and dictating the profitability of the transaction," Kraupie said.